This gorgeous resort towers over the Atlantic. Relax in the living room after a long day or savor the ocean from your balcony. Indoor and outdoor lazy rivers and two pools make for tons of family fun. When you're not lounging on the beach, the pool is a great place to kick back. Kids and adults alike will enjoy the gorgeous onsite mini golf course. You're in the heart of Myrtle Beach with tons to do nearby. This indoor lazy river is great for rainy days, and adorned in columns and a statue. Enjoy a refreshing cocktail at the poolside Tiki bar. Camelot by the Sea by Oceana Resorts is conveniently located in the heart of Myrtle Beach on the Grand Strand. Get your day off to the right start with a stop at the Dunkin’ Donuts on-site for a donut and an iced coffee on your way to your condo. After dropping off your luggage, get changed into swimsuits, grab water wings and goggles, slather everyone in SPF and get ready to be amazed. You will have your pick of indoor & outdoor pools and the 2 children’s pools will delight the little ones. Lounge with a refreshing cocktail from the poolside tiki bar and the book you’ve been meaning to finish. Relax in the 200-foot heated indoor lazy river or the 16-person hot tub. But wait, there’s more! Reward yourself for your vacation planning skills with a massage, facial or body treatment at Awakening Spa, located at sister resort Anderson Ocean Club. Studio and one- to three-bedroom oceanfront residences sleep four to eight guests. A family field trip to the Piggly Wiggly Supermarket is definitely in order – your full kitchen won’t stock itself. Recruit the kids to help bake your famous double chocolate brownies (not that they’ll need convincing). Once the brownies are in the oven, there’s a good chance that the kids will look like they’ve fallen into Willy Wonka’s chocolate river. Don’t panic. Take advantage of the in-suite washer/dryer (in 2- and 3-bedroom units) or the laundry facilities on-site. After all of that excitement, a low-key night in is just what you need. Flatscreen TVs with DVD players are perfect for family movie night. Browse the collection of DVDs available to rent (for free!) at the resort or bring favorite movies from home. Pop some popcorn, gather everyone on the couch and ask for a show of hands to decide what to watch first. During the summer, resort guests receive free unlimited admission to Wild Water & Wheels Water Park. 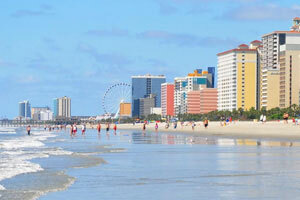 Broadway at the Beach is one of the most popular tourist attractions in Myrtle Beach. Legends in Concert pays tribute to five acts in one show. The line-up changes frequently and past tributes have included Elvis, Dolly Parton, Lady Gaga and Madonna. Take a selfie with your favorite star at the Hollywood Wax Museum. Featured stars include Marilyn Monroe, Brad Pitt, Beyonce and Johnny Depp. Let the kids explore the exhibits at Children’s Museum of South Carolina. Kids can be a doctor, contractor, artist or paleontologist. They will have so much fun that they won’t even realize that they are learning. The name on the credit card used at check-in to pay for incidentals must be the primary name on the guest-room reservation.